This 11 cm long bronze sculpture of a little girl dancing was found by archaeologists in 1926. Believed to be one of the most famous pieces of Indus Valley art. This sculpture also shows that the people liked and knew of some form of dance. 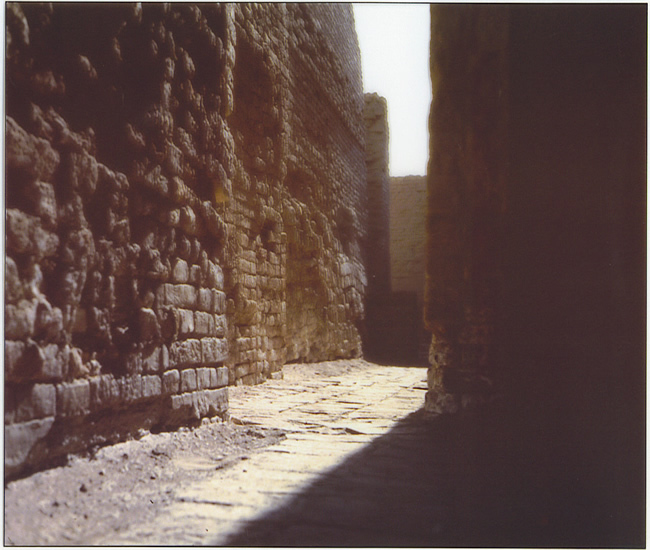 This picture shows the walkway through the civilization. Art throughout the civilization ranged from jewelry to pottery. Archaeologists were able to find a few artworks from the Mohenjo-Daro city. One of the most famous piece of art found in Mohenjo-Daro is known as the "dancing girl." The people also carved seals from steatite with over 400 kinds of pictographs on them resembling various animals, objects, ideas and sounds. Each seal were from about .75 to 1.74 inches. One that both cities shared would be using pottery wheels for making clay pots ranging from plain to decorated ones. Their bowls and dishes ranged from being made out of terracotta to bronze to copper and to silver. Structures from both Harappa and Mohenjo-Daro was usually built with baked bricks. It is observed that throughout the cities there were not many monuments, palaces, or temples. The layout of the houses were of multiple houses along a small alley houses. Majority of the homes were two story, flat-roofed, mud-brick homes. Although the structures were pretty much identical, some houses had one room while others had twelve. It is believed citizens with one room homes are poorer than the multiple rooms owners. Civilians of the Indus River Valley Civilization loved wearing jewelry. They wore things from earrings, necklaces, beads, and more. Four examples of the different kinds of pictographs that were on seals. This 8 feet by 39 feet by 23 feet rectangular pool is known as the Great Bath. The water supply used for bathing came from wells.